Diabetes care is a daily challenge that causes strain on relationships and can alter the way family members interact with each other. Type 1diabetes, also known as juvenile diabetes, is usually diagnosed in children although young adults may be diagnosed with it as well. This type of chronic diabetes means that the pancreas doesn’t produce enough insulin, which is required to process glucose and other sugars into usable energy for the body. With proper education, medications, glucose monitoring, and proper diet, experts agree those with diabetes can have a very high quality of life. However, the person who has diabetes often affects nearly everyone around them because of their specialized needs. There are several informative websites that offer support and education for families about chronic diabetes and supply details on how to cope with the circumstances that may come about if the person associated with someone affected with diabetes may not be aware of their condition. While parents of diabetic children have to help them understand and manage their illness, others in their lives will be affected as well. As they begin dating and marry, the mate will have to be made aware of the ramifications of what a person with diabetes has to cope with. Although they will need to recognize all those aspects, they should also be informed about what all is involved when it comes to helping to care for someone with diabetes. More sever health problems could develop for those who suffer from diabetes as they get older. These problems can include strokes, kidney disease and heart problems. Diabetes is also to blame for most leg amputations that aren’t associated with physical trauma like those from car accidents. 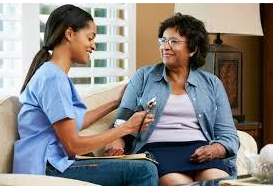 Experts advise that patients and their loved ones or Home Care Services find all the information possible about the disease and to have consistent monitoring and examinations to be aware of and to prevent further medical complications.